9/29/2015 – Success! 508 hens liberated from a free-range farm are now safe and sound at our adoption center in Vacaville, CA. Unfortunately almost all the hens are in respiratory distress and are being treated for an active infection. At least a dozen of the hens have severe sinus infections and will require more intensive care. We saw no roosters at this farm – all of Rosie’s brothers were killed the day they were hatched. 500 little red hens on a midnight caravan to freedom! Get ready to welcome 500 precious chickens to our shelter and adoption center next week, including superstar-to-be Red Rosie! What do you say to a farmer asking if we will take in hens or they’ll be slaughtered? Even when your adoption center is almost at capacity? Yes, obviously! Okay, so there are still 1,300 hens, four roosters, four pigeons, and two goats at our Rescue Ranch shelter, but with a little re-arranging (and a little help from friends) we made room for 500 more lives. Each individual as valuable and precious as the next. The farm is a free-range facility, housing thousands of hens in mobile sheds. While their welfare may be better than 95% of their caged sisters, the end of the line for all hens on commercial farms is death. Animal Place’s Rescue Ranch program – the only one of its kind in the nation – saves hens from being killed and finds each and every survivor a permanent, loving home. Rosie will become rescued animal #17,987….nearly 18,000 animals have been saved from death in the past five years. A special thank you to our Flock Partners Forget Me Not Farms at Sonoma Humane Society and the Napa County Animal Shelter for taking in some of our current hens to free up more room for the new girls! Apply to adopt! We may save the hens from death, but our adopters are the real heroes – they give each hen a life of love and compassion. Even better, the adopters are changed by their experiences with adopted hens. Many reduce their consumption of animal products, stop buying eggs commercially, and start feeding eggs back to the birds as a way to help these hens recover calcium lost from laying too many eggs. We love our adopters! 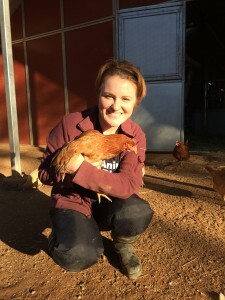 Volunteer with the hens! It takes a village to help care for nearly 2,000 animals! Sign up today to volunteer in VACAVILLE, CA at our Rescue Ranch shelter! Go egg-free! Share Rosie’s rescue and encourage your family, friends, colleagues, random people on the street that egg-free is cool and kind. Learn why the commercial egg industry (including hatcheries supplying chickens to the backyard chicken movement) are terrible for the birds. Such Wonderful People!!! Had No Idea such a Dire Situation Existed. Is there anything like your organization in Illinois? We’re not 100% sure. You can check out our site http://www.sanctuaries.org to see if there are sanctuaries near you! Thank you, thank you, thank you!!!!! You are all angels. I wish I could meet all of you…such beautiful people. Thank you so very much for all you do for the animals. I only use eggs from my own flock. They have 5 acres of free range, along with geese, turkeys, and sheep. I’m the only person I know who has buried a tom turkey who died of old age! Keep up the wonderful work! Your kindness and compassion for these animals is beautiful. God bless all of u . I wish I was i. The area to volunteer . ?? Thank you for taking care of these animals. Every singe one counts. I wish I could volunteer there but I don’t live in the area. Just like dogs and cats, the support of the chicken “pet” breeding needs to stop. What folks don’t understand is that if you buy chicks you are perpetuating an industry that kills male chicks at birth in horrendous ways. If you must have eggs, adopt rescued chickens and eat half and feed half of the eggs back to them to replenish their calcium deficiency. That is the only way I know of to eat eggs and cause no harm. Your organization is wonderful, and, of course, rare. Too few people care about farm animals. I am one of those who do. If I was younger and healthier, I would, definitely, volunteer. As a substitute, however, I, hopefully, will donate something to your organization, in my will–considering my age and poor health, it won’t be too much of a wait. It’s difficult to believe that you will be able to find good homes (for all of their natural lives) for all those hens (1300 plus 500)! You must have a lot of compassionate contacts! I may be interested in adopting some birds. But need to get more information on the care needed and how to build a chicken coop so they can be free and have a home for comfort. I would love to have a couple chicken friends, but one has to stand on their head for months in order to even present the request in this silly town I live in. Too much noise they say. I personally would love to be awaken by chicken songs!! Not that they are very loud and I may not be able to hear them clearly – just the hum would be pleasant! My uncle had a farm in NH with many chickens. l When I could catch a chicken and would hold her she actually seemed to enjoy the caress. I loved the warmth and softness of her! So Sharie I hope you are able to adopt some of these lovely birds. I have taken in several creatures to save them from euthanasia, none have I given up on!